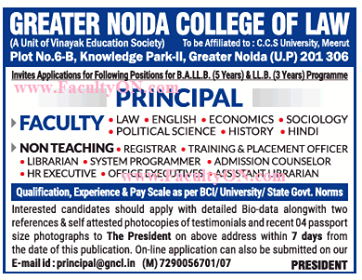 Greater Noida College of Law, Gr Noida has advertised in THE TIMES OF INDIA for the recruitment of Faculty plus Principal job vacancies. Interested and eligible job aspirants are requested to apply with in 7 days. Check out further more details below. How to Apply: Interested and Eligible candidates may send your CV along with self attested copies of certificates and4 passport size photograph to the following address and by email with in 7 days.